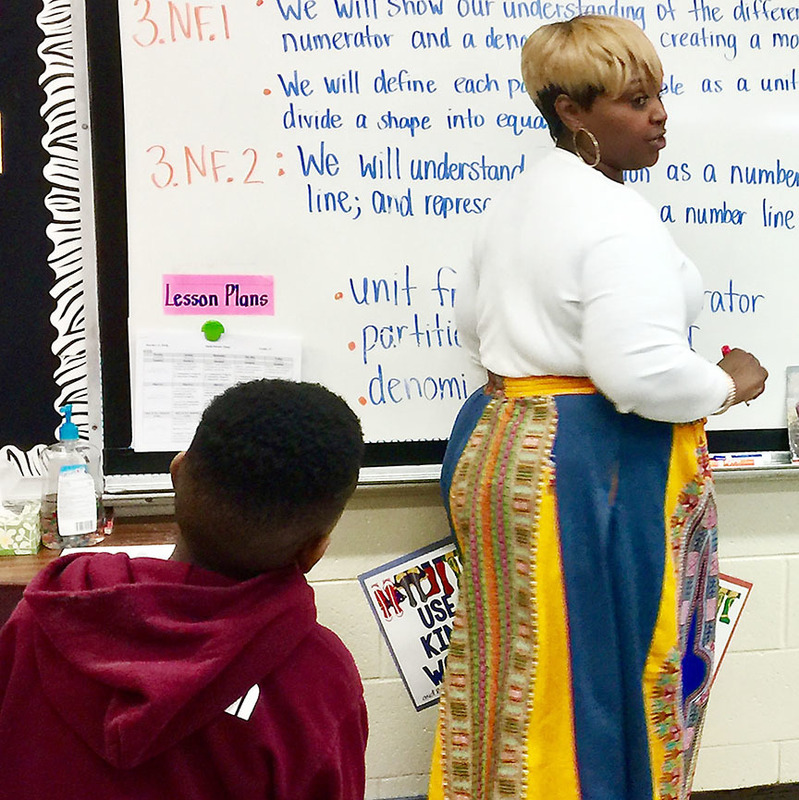 Ebony Wells, third grade teacher at Blytheville Elementary School, guides her students as they try to calculate net force during their study of “Forces and Interactions” in late February. The students learned about net force through an imaginary tug-of-war. As part of the Next Generation Science Standards, third-graders at Blytheville Elementary School are now in the middle of a study that a generation or two ago might have been seen as too advanced for them. The students are studying “Forces and Interactions”, reality-based hands-on lessons as part of the NGSS that were developed by states to improve science education for all students. The third grade math/science teachers at BES include Eboney Wells, Theresa Bentley, Courtney Flood, Megan Trucks and Felice Williams. For example, an unbalanced force on a car, one side of the ball or in a game of tug-of-war can make that subject begin moving, she stated, whereby equally balanced forces pushing on an object will produce absolutely no movement. Felice Williams’ students discovered the relationship among force, friction and position by experimenting with toy cars, while students in Megan Trucks’ classroom designed bridges that could hold a certain amount of weight. Williams and teacher intern Abby Rigney instructed their teams of students to push their cars down heights of one to three books, and then to create graphs that went with their experiments. While pushing the car down various heights, created by stacking books, one book being approximately three inches, limited it to a short distance, pushing it down two and three books (about four and five inches, respectfully) produced significantly more distance. Williams said the students noted in their records that when the cars encountered friction, such as rolling onto a towel, that surface significantly impacted how far it traveled; the cars were able to travel a greater distance when there was less friction. Trucks’ students were tasked with constructing paper bridges and then stacking pennies on the bridge to test its strength. She stated that most bridges could not support even the weight of a small amount of pennies. Trucks allowed them the opportunity to examine how the bridges were built and to re-design them as needed. “My students learned that the quick way of constructing their bridges is not always the best way to build them, but by re-designing them in the wake of failure they can always make the bridges better,” Trucks said. Starks continued that the students learned these lessons about forces through “discovery”, hands-on experience. “The teachers want their students to learn through exploring, getting the facts through experimentation,” she said. “Research shows that the more students are able to make real world connections and engage in hands-on experiences, the more students are able to retain information as they see the relevance of the concepts.” She added that only through their investigations can the students learn the importance of controls and constants in conducting experiments.